The first chief of the paid Pueblo Fire Dept., he was also the last chief of the Pueblo Volunteer Fire Dept. Tragically, he was killed just after he was voted in as chief for a second two-year term. He was practicing with his chief's buggy up on West Abriendo at Carlile Springs (what is now Dutch Clark Stadium), when his horse was spooked and overturned the buggy, throwing Krague . He struck his head on a rock and died several hours later from his injuries. His funeral was Pueblo's largest attended funeral up to that point and for many years to come. Above is a gavel presented to the mayor of Pueblo by the Pueblo City Marshal and the Pueblo Fire Chief Robert J. Krague in 1890. Signature of Robert Krague on a Certificate of Membership to the Pueblo Volunteer Fire Department on display at the Hose Co. No. 3 - Fire Museum. Chief Krague was not only well liked, he was also an innovative firefighter. He invented and patented an electrical wire cutter after a hobo was electrocuted during a fire. He was responsible for Pueblo going to horse-drawn fire wagons and the purchase of a steam pumper when the department went paid. He did receive some flak for the naming two of the horses, however. The two members of the city council didn't appreciate having horses named after them. Below is the gravestone of Robert Krague at Roselawn Cemetery in Pueblo. 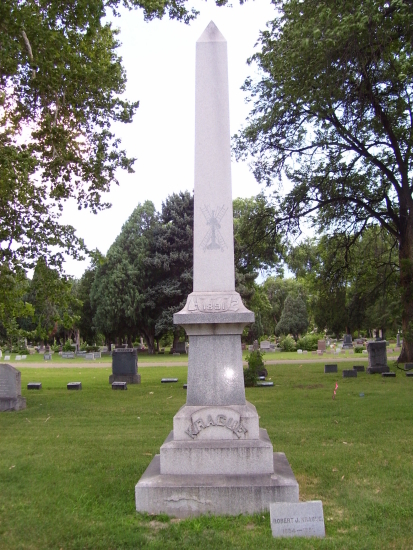 The obelisk stands about 15 feet tall and is in Block 30 at the cemetery. 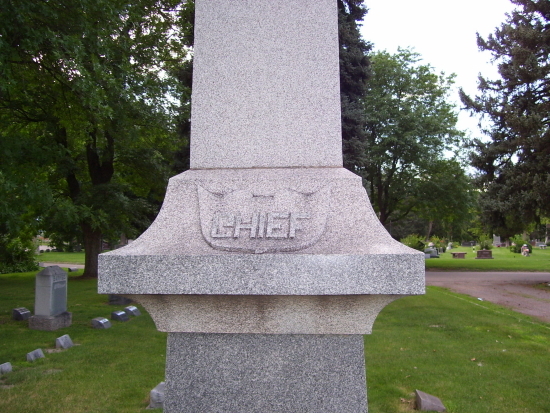 The above left picture has "CHIEF" written on it, and is on the left side from the front. 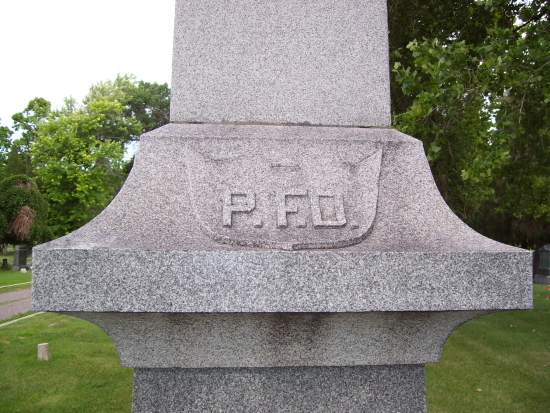 The "1891" in the center picture is on the front of the gravestone, and the "P.F.D." 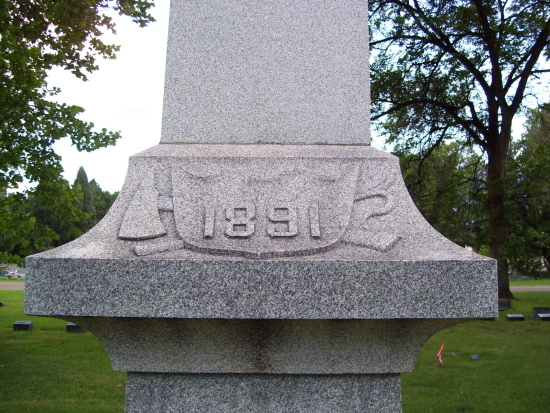 in the right picture is on the right side of the obelisk. The assistant chief under Chief Krague, Sanborn was a longtime volunteer fire dept. member in the Orman Hose Co., as well as an asst. chief with the South Pueblo Vol. Fire Dept. in 1885, and the merged Pueblo Fire Dept. in 1886/87. He took over as chief when Robert Krague was killed in 1889, and served out his two year term. He stayed on the department after George Hook was named Chief, and stayed on for several years. The above left photo might be that of Tris Sanborn. It was taken from the photo on the right (with the man in the center of the picture), the Mardis Gras Parade float of the G. Q. Richmond Hook & Ladder Co. just before they became the paid department. Sanborn was the "janitor" of the volunteer department at the time of the picture, which was the only other paid position other than that of the Chief and Asst. Chief (and he made more than the asst. chief.) It said in The Pueblo Chieftain of the that the janitor had a uniform. 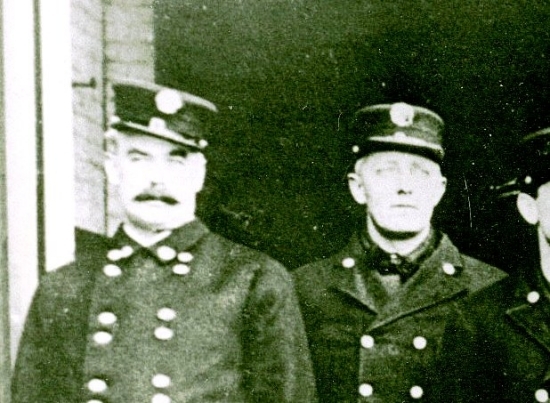 In the picture above left, the man (possibly Sanborn) is wearing a fire department-style uniform, except a Chief or Asst. Chief would have a white hat, and the chief wore a double breasted rows of buttons. However, this still can't be proven other than process of elimination. A former chief of the volunteer fire dept. and member of the Carlile Hose Co., Hook took over from T. D. Sanborn. Hook was also the Fire Warden before being named chief and served two terms (4 total years) as the fire chief. The Mesa Hotel fire, on October 9, 1893, was the largest fire during Hooks time as Chief. The 7-story building on the corner of Abriendo and Broadway burned nearly to the ground just after being built. The part of building that could be salvaged can be seen across the street from the Hose Co. No. 3 - Fire Museum. The damage was assessed at $140,000. Herd was a former chief and asst. chief of the volunteer fire department, member of the James Rice Hose. Co., and fixture around the department for over 30 years. As chief, he pushed for reforms and modernization of the department throughout his career. The DeRemer Theatre fire on February 12, 1899 was the largest fire of Chief Herd's tenure. It burned the theater, located at 7th & Main Streets, to the ground, doing over $50,000 worth of damage. 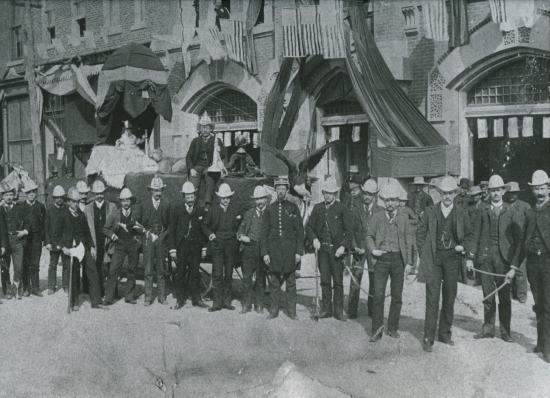 The above picture is the first known picture of a Pueblo fire, the DeRemer Theatre fire in 1899. The original photo is on display at the mueseum. When Howard Shoup was named chief on April 19, 1899, he was the fifth chief of the department in 10 years. The Foley Block fire at the corner of Northern and Evans on August 19, 1900 ended up burning 17 buildings and entire city block. It started at the Foley Lumber Co. and spread throughout the block, doing over $100,000 in damages. Shoup was a member of the Bessemer Board of Trustees when the Bessemer City Hall was built (later to become Fire Station 4.) His name can still be seen on the cornerstone from the original building, which is located at Fire Station 4 at Evans and Mesa in the Bessmer section of town. Assistant Chief under Chief Herd, Pat Bradford was a longtime member of the department. The Moch Bros. Department store fire on February 14, 1902, and the Prudential Building fire on June 6, 1902 were large fires under Chief Bradford's time. The Moch Bros., located at 2nd & Main Streets, did $50,000 in damage, while the Prudential Bldg., at 6th St. & Santa Fe Ave., burned to the ground and was valued at $125,000. 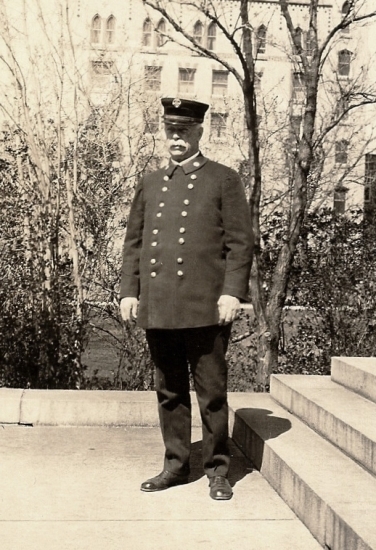 An assistant to Chief Shoup, Ringer helped to modernize the fire alarm system for the city. Major fires during Ringer's two years were the 7th Day Adventist Church and St. Mary's Hospital. There was a fire at the Frank Pryor Furniture Co. at 2nd & Main Streets on August 25, 1903. Mr. Pryor was quoted as saying, "The firemen did some of the best work I ever saw," and gave a $100 check to the fire department. 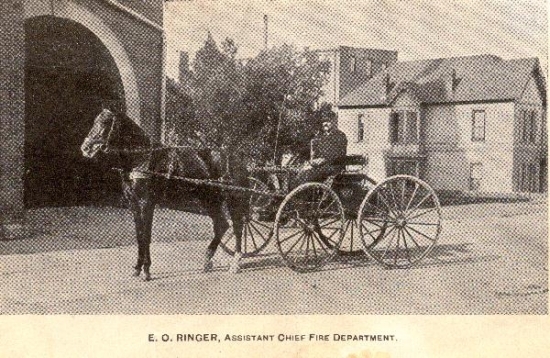 This picture came from the 1902 yearbook that the Pueblo Fire Department put out to the public when Ringer was an Assistant Chief. Chief McCartin was with the department for ten or more years, before serving as fire chief for two terms. He would go on to be the chief of the Colorado Springs Fire Dept. from 1909 through 1931. During his four years as chief, some of the biggest fires were the Bergerman Brothers Clothing Co. on April 24, 1905 that did $80,000 in damages, the Mountain Ice Co. on August 16, 1905 that did over $100,000 in damages, the C Street. viaduct fire on April 24, 1908 that did $62,000 in damages, and the Hyde Paper Co. on December 3, 1908, that did $85,000 in damages. 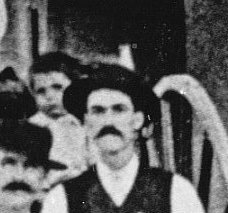 Pat McCarty in photo taken in 1904. Pat McCartin was also quite the boxer when he was younger, fighting as a middleweight in Milwaukie, Wisconsin. 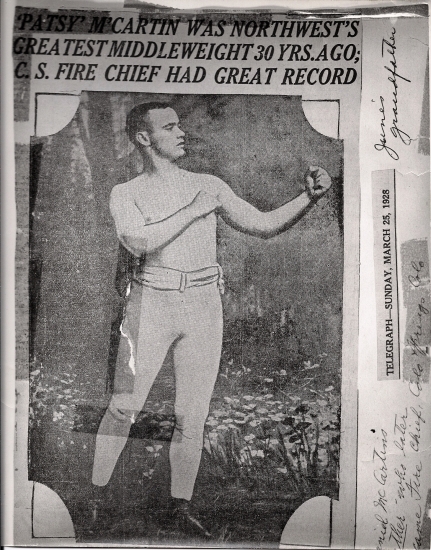 "Patsy" McCartin was also a member of the Milwaukie Fire Department from 1880 until 1898. He also was a boxing referee in both Milwaukie and Pueblo. He officiated at several bouts by Pueblo's "Fighting Fireman" Joe Flynn, the only man to ever knock-out Jack Dempsey in the ring. Newspaper article on Pat McCartin, dated March 25, 1928. (left) Fire Chief Pat McCartin of the Colorado Springs Fire Dept. circa 1925. 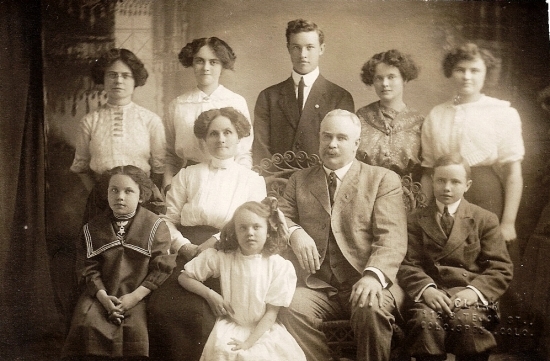 (right) Pat McCartin with his wife and eight children circa 1920. A member of the department since 1894, Willis would be the last of the "New Mayor, New Police Chief, New Fire Chief every 2 years" cycle. He would stay on after his two years was up and become the Captain at Engine Co. 3's. Chief Willis purchased the first motorized vehicle for the department, a car for the chief. Willis started out in the Corkish Hose Co. of the volunteer Pueblo Fire Dept. in 1885. Charles Willis with the Corkish Hose Co. No. 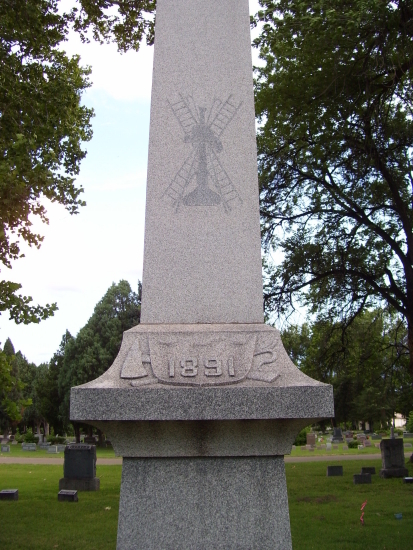 6 in 1886. He is standing in front and to the left of the right wheel of the hose cart. Below is a close up of him. 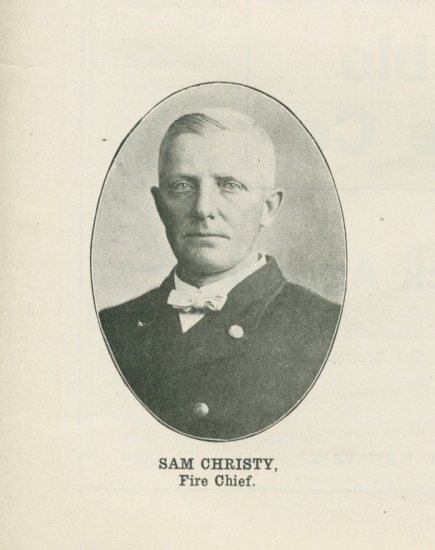 Chief Samuel Christy was the first chief to ever serve more than four years as the chief of the Pueblo Fire Dept. He would serve as fire chief for twenty years, the longest tenure in the fire department's history. A very forward thinking chief, he would modernize the department. When he took over as chief, the only motorized piece of equipment was the chief's car. Within four years, Chief Christy would motorize the entire department by 1915. 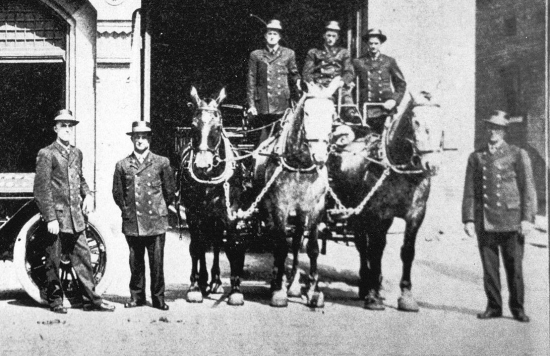 Chief Christy (second from left) with the 1911 American LaFrance Chemical Wagon, Pueblo's first motorized truck. Christy would continue to be an innovator and help Pueblo to become one of the most progressive departments in the country under his reign. Christy allowed the firemen to unionize before there was an International Assoc. of Fire Fighters, and also was the chief when Pueblo was a founding member of the IAFF, becoming Local No. 3. Christy would go on to build many of the pumper truck that Pueblo used by putting a pump that would boost water pressure by 100 pounds on a small truck chassis. This became known as the Christy Pumper. Built by the Pueblo City Shops per the chief's instructions, the idea caught on with many municipalities, due to the low cost of building the trucks themsleves. The DeLaval pump ad for the Christy Pumpers in 1925. The Christy Pumper featured in "Methods, Materials, and Appliances" in 1921. The Pueblo Fire Dept. was featured in many advertisements during the years Christy was chief. 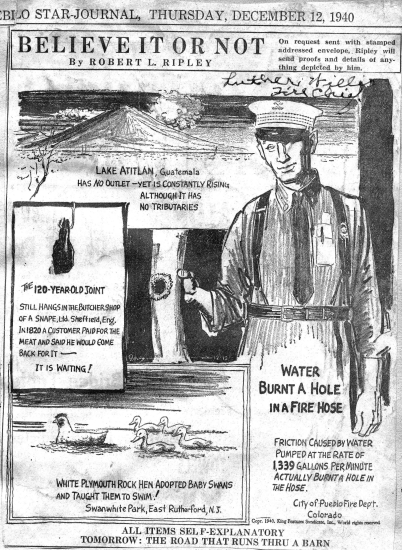 Ads for Firestone Tires, several ads for American LaFrance fire trucks, the above DeLaval ad, as well as articles in sevral other national publications. It was during Chief Christy's time that the Grand Opera House fire happened (please see pictures and article in the Major Pueblo Fires tab), in 1922. He retired in 1931, though stayed close to the department even after his retirement. He passed the torch to his assistant chief, Luther Willis, who would continue to keep the Pueblo Fire Dept. moving in a positive direction. Chief Luther Willis started his career with the Pueblo Fire Dept. in 1912. Younger brother of deptartment member and former chief Charles Willis, Luther would dedicate his life to the department and learn well from his 20 years under Chief Christy. When Christy added a second Assistant Chief in 1921, he promoted Willis into the position. For ten years, Willis would serve as assistant chief. 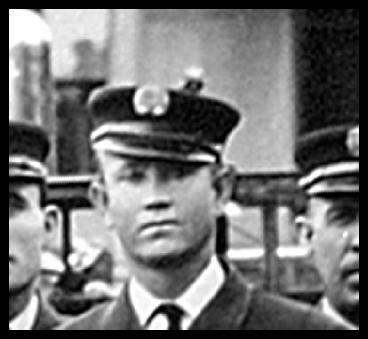 The picture of Luther Willis (on the far right) was taken the same year he came on the department in 1912. His brother Charles is on the far left. Above is a picture of Luther Willis in 1915. Under Chief Willis' guidance, the Pueblo Fire Dept. created a First Aid truck and started to run a lot more medical calls. This was when a first aid truck was rare on a fire department, even in the larger cities. Chief Willis also started the fire prevention program for the department and the program of going to the schools to educate children on fire safety. Chief Willis (above) in 1938. Ripley's Believe It Or Not newspaper daily featuring the Pueblo Fire Department and Chief Luther Willis, dated December 12, 1940. 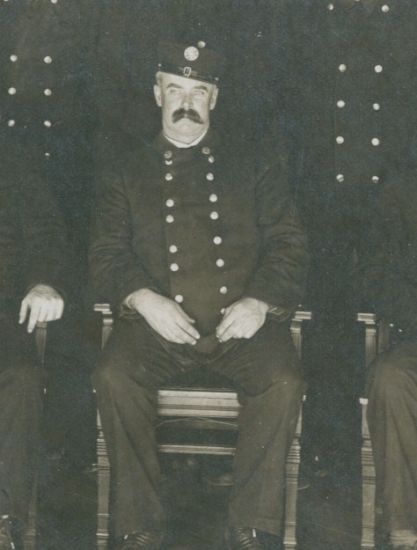 J. J. Fitzpatrick in 1940 when he was an assistant chief. Harry Whitcomb in 1940 when he was a Captain.